Eternal Flame Falls !!! | Do You Know? 1. 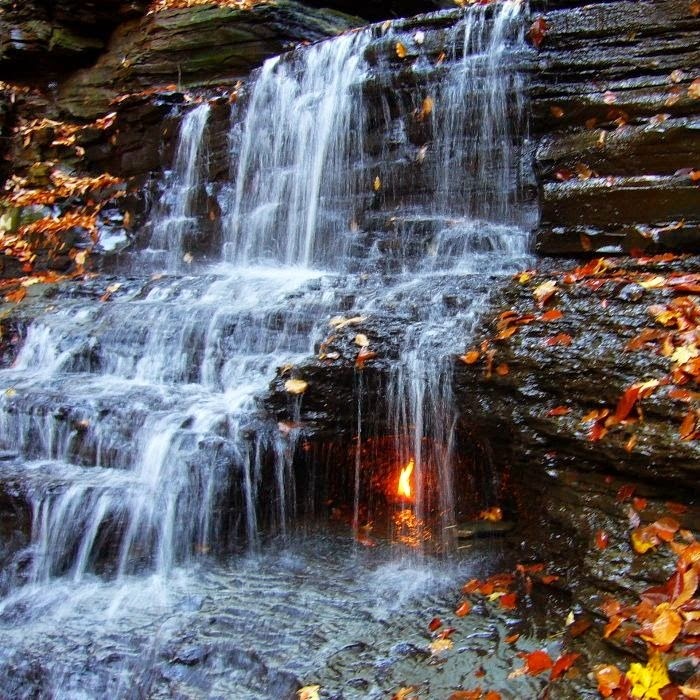 The Eternal Flame Falls is a small waterfall in the Shale Creek Preserve, a section of the Chestnut Ridge Park in New York. 2. A small chamber under the waterfall produces natural gas, which keeps the flame alight. 3. Scientists have been thinking that the eternal flame was kept alight by gas produced by ancient, extremely hot rocks. 4. There are hundreds of 'natural' eternal flames around the world, and each one is thought to be kept alight by natural gas produced from the rocks beneath it. 5. A recent study claims that the scientists' belief was wrong. Researchers from Indiana University have discovered that the rocks underneath the Chestnut Ridge County Park aren't hot enough to produce this gas, which means another process is producing the gas that's keeping the flame burning. But they are unsure what that process could be. 6. So you see that eternal flames are quite common but the picturesque created by a lone flame under torrents of water make Eternal Flame Falls unique. 7. These falls are special because massive amounts of water around it could not do any harm to the eternally burning flame.